One excellent way to reduce production cost per plant is to make better use of greenhouse space. The cost of providing the right environment is the same whether you are utilizing 50% of the space or if every square inch is covered with plants. The following are ways in which production can be increased up to 100%. Some may require modification to the system you are now using; others are just common sense ways that we tend to overlook at times. During the energy crisis of the 1970's when bedding plant production as we know it today, was in its infancy, most growers grew plants on the floor. It was common practice to leave only enough walk space to place one foot in front of the other. Space utilization was almost 100%. This low cost system can be improved today with heated floors and boom watering. Access is only needed to observe the plants. When shipping time arrives, a work aisle can be created by removing the plants out of the center of the greenhouse first. A modification to the above system being adopted by the larger growers is the flooded floor system. Although costing more for the concrete floors, pumps, tanks and controls, plant production is very uniform allowing all the plants to be removed at the same time. Handling of the plants is best accomplished with a gantry that straddles the width of the bay or by a cart system. For crops that require more maintenance (pinching, pruning, repotting) a bench system is more convenient because plants are at a working height. Stationary benches are best for retail sales areas. Either the traditional longitudinal arrangement or the more efficient peninsular system can be used. Typical bench widths are 4 – 5 feet and main aisle widths of 3 to 5 feet or side aisle widths of 20 to 30 inches are common. Several arrangements are shown in Figure 1. The most common support for the bench top is galvanized steel tubing or pipe. This has a long life and is easy to construct. 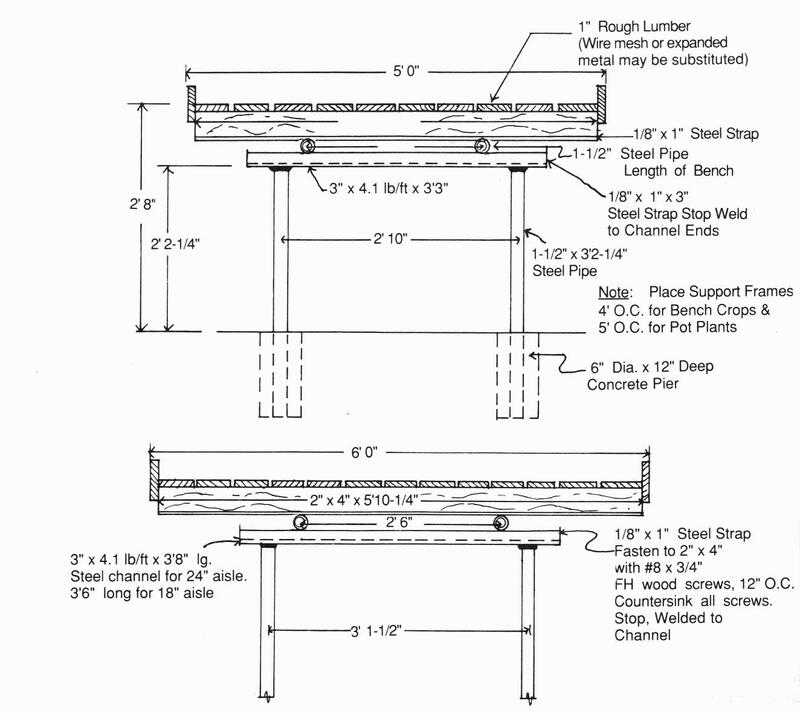 A less expensive alternate is concrete blocks with tubing or pressure treated lumber runners (Figure 2). Bench tops can be of a number of materials, wood, plastic, wire mesh or expanded metal. Each has advantages and disadvantages. The bench top material should be strong without sag so the pots and flats remain level, allow containers to slide easily, be resistant to corrosion from fertilizer and water, have no sharp edges and be easy to install. Wood – Used pallets are modular and available in several standard sizes. They can sometimes be obtained free for the taking or if purchased are only a few dollars each. They will provide adequate support for the plants. The life is limited as the wood is not pressure treated and often the edges break from use. Snow fence is used by some growers. This has stained 3/8" x 1-1/2" slats and is available in 4' x 50' rolls. It is easy to roll out on the bench supports. To get a longer service life, select pressure treated lumber. Local home centers and lumber yards usually carry ACQ (Alkaline Copper Quat) 1" x 6" lumber or 5/4" x 6" decking. Life is 20 years or more. Nails and screws need to be specially treated to reduce corrosion. Naturally long life wood such as cedar, redwood, and cypress are too expensive for large installations. Another more expensive alternative is composite lumber manufactured from sawdust and plastic molded into lumber. These are very strong, are easy to fabricate and have a long life. Their use is generally limited to garden centers. Welded Wire – This is a low cost option that makes a good bench top if adequate support is provided. It is best to use a 10 or 13 gauge wire with a 1.5" x 1.5" mesh to avoid too much sag. Purchase wire mesh that has been galvanized after welding. Welded wire can also be obtained with a colored plastic coating to give a better appearance. Welded wire can be formed into self-supporting bench tops (Channel Top – www.bbwire.com that eliminates the need for the cross frame supports. Galvanized expanded metal – This is the most common material for strength and long life. Available in widths from 2' to 6' in panels to fit standard benches. Metal thickness is usually 13 gauge. Standard material needs to be supported on 24" centers. The expanded metal is frequently inserted into an extruded aluminum frame. There is little maintenance to this material. Plastic – Tops molded from recycled polypropylene plastic are easy to assemble and provide protection from chemicals and rot. They are available in several colors. Typical panel size is 1.5' x 3' or 2' x 4'. Interlocking tabs hold them in place. With heavy plant loads, the top may sag if not supported properly. Cost is competitive with the metal materials. Troughs – These aluminum or plastic channels are placed on supports that pitch from an irrigation water supply end to a sump. They are best adapted to pot plant production and are available is several widths. Ebb and Flood – These molded trays have grooves and a sump for drainage. They can be self-contained or can be inserts that are placed into an aluminum frame. The trays are frequently manufactured from recycled plastic. This is the traditional method of adding growing space in larger greenhouses. Up to 90% of the total greenhouse area can be covered with benches. 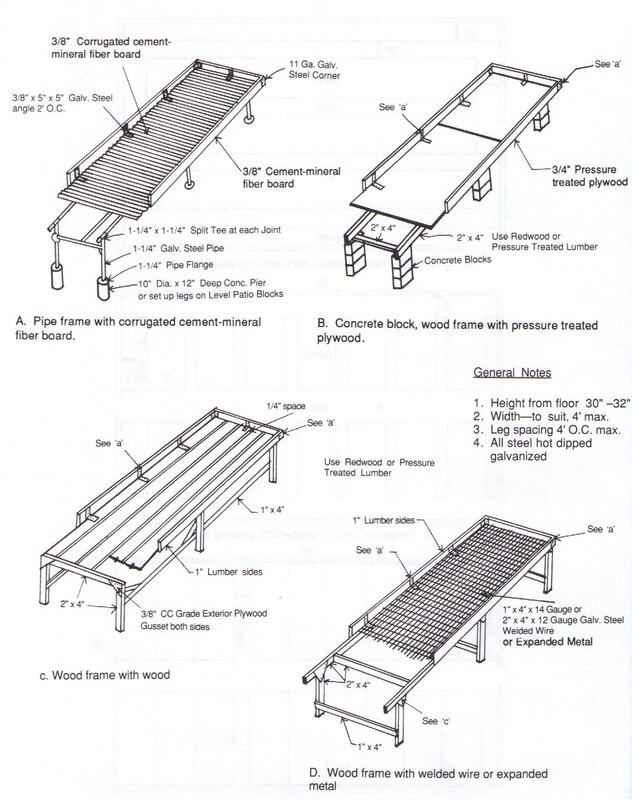 Two types of systems are common, bench and tray systems (Figures 3 & 4). The basic concept is to install benches over the whole greenhouse area except for one movable aisle that is used for tending the plants. The bench tops are supported on pipe rollers and allowed to move sideways 18 to 24 inches, the width needed for a work aisle. When you need to get to a particular bench, the remaining benches are pushed aside, leaving the work aisle. The steel rollers create very little friction and a 200' bench can usually be pushed by hand or moved with a crank at the end. Frequently existing benches can be converted to movable ones to save on cost. Because the benches move, automatic watering, bottom heat and electrical system have to be supported from the floor or the bench supports. 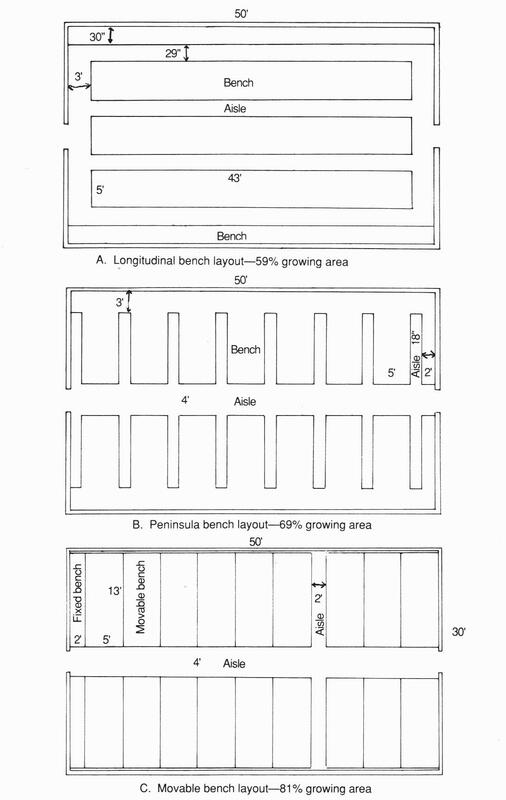 Moving plants in and out of conventional bench systems is labor intensive. Walking with one flat or a couple of pots at a time adds considerable cost to the plants. Walking 25 feet, picking up a flat and walking back to a cart takes about 23 seconds. At $10/hour this adds over 4¢ to the cost of that flat. This cost is added every time the flat is moved. Tray systems have been developed to reduce this labor. The tray system saves considerable labor as the plants don't have to be carried to a cart or conveyor. Trays are usually loaded with potted plants or flats in the headhouse then moved to the greenhouse. They can be moved back to the headhouse for spacing or maintenance. When ready for marketing, they are moved to the shipping area. Some growers ship directly on the tray saving additional handling. Tray systems have the shortest payback the more times plants have to be handled. Tray size is usually 5'to 6' in width and 8' to 20' long. The trays should be designed to fit the type of growing container that you use and the space available in the greenhouse. They can also be designed for an ebb and flood system with recycled water. Two types of tray transport systems are common. The roller conveyor system uses flat bottom trays that ride on trolley wheels or fixed casters attached to support rails. The trays are guided by the design of the support wheels. A rail system is installed to move the trays from the headhouse area to individual greenhouses. Attached plastic trolley wheels support the flat bottom trays. An alternate system uses rails that support trays with wheels mounted to the underside. The transition from one direction to another requires two sets of wheels. Manual or pneumatic lifters transfer the tray from the growing area to the conveyor. Movement to or from the growing area is usually done manually. Several trays can be pushed at a time by one person. A computer controlled, motorized system is available but not common in the U.S. In this system, multiple trays are loaded onto a transfer cart. A growing location is designated by the operator and the cart is automatically moved to that location. Trays are off-loaded automatically. The computer keeps a record of the location so that it can find them when they are ready to be shipped. A system such as this can handle up to 150,000 locations in the greenhouse. In the second system, the rollers are attached to each tray and ride on the smooth pipe rails. One set of rollers provides the guidance and the other is just for support. To get the trays from the headhouse to the greenhouse, a transport cart is used. This low-cost cart travels in an aisle along the end of the tray lines. A tray to be moved is rolled onto the cart and locked in place. The cart usually has four support casters and a guide wheel. This wheel follows a rail mounted to the floor to guide the cart as it is pushed. The cart needs to be designed to fit the size of trays. It can be designed to carry one or two trays at a time. Cost of the transport cart is $2000 - $3000. Considerable labor is required to handle plants from the time the containers are filled until the time the plants a shipped to the garden center. Although a tray system costs $10 - $20 per square foot, the payback is fairly short due to the significant savings in labor. You can double growing space by placing one layer of plants on a heated floor and a second layer 20" to 30" above the floor on a rack system. During the day the trays are rolled outside the greenhouse onto a matching pipe network. Both crops receive full sunlight. At night, they are rolled back into the greenhouse. This system can be adapted to both hoophouses and gutter-connected ranges. The system is good for hardening off bedding plants during the spring and for potted plant production during the fall. 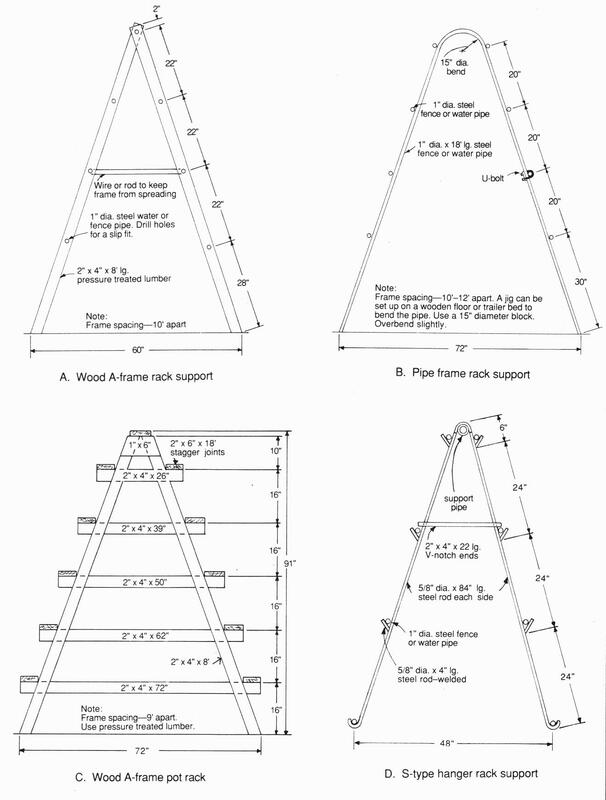 If you are growing hanging baskets or larger potted plants, an A-frame rack system can double your growing space. Racks are especially effective where foliage plants are grown, creating conditions similar to a forest canopy. They can be built with 2 x 4 lumber and fence pipe or with heavy steel rod. 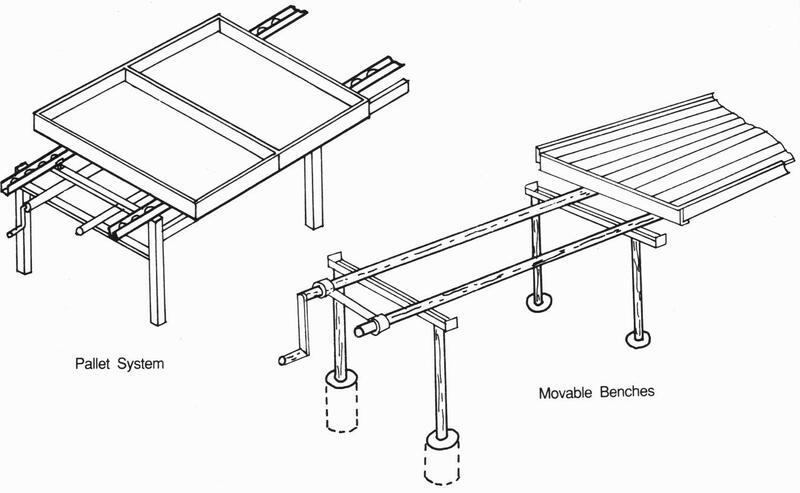 Racks can be made movable but are usually fixed to the floor or overhead trusses (Figure 5). Be sure that the greenhouse frame is strong enough if you are going to suspend them. Many growers hang baskets over part of their growing area to increase space utilization. These baskets are fitted with an automatic watering system and the spacing depends upon the light requirements of the crop on the floor or benches beneath. Normally two rows of baskets every 20' will not adversely affect the crop underneath. A more efficient system is the hanging basket conveyor (Figure 6) which is attached to the overhead trusses in the greenhouse. Plants spaced as close as 8" apart are supported by a conveyor that moves them past work and watering stations. The convenience of having plants brought to the end of the greenhouse for inspection and shipping can offset the cost of the system. Multiple layers of plants can be grown with special plant hangers. A greenhouse with a 16' – 20' gutter height is usually required. A few growers utilize the space under benches for a production area. It works well for crops such as ground cover. By adding about 25 watts of fluorescent light per square foot, low light crops can be grown. Watering is more difficult and there could be increased disease problems. I have been in many greenhouses where wide aisles were installed to allow for movement of plants. In gutter-connected houses these are sometimes 10' to 12' wide. This wide an aisle is seldom needed and some of the space could be filled with plants, either on the floor, benches or racks. 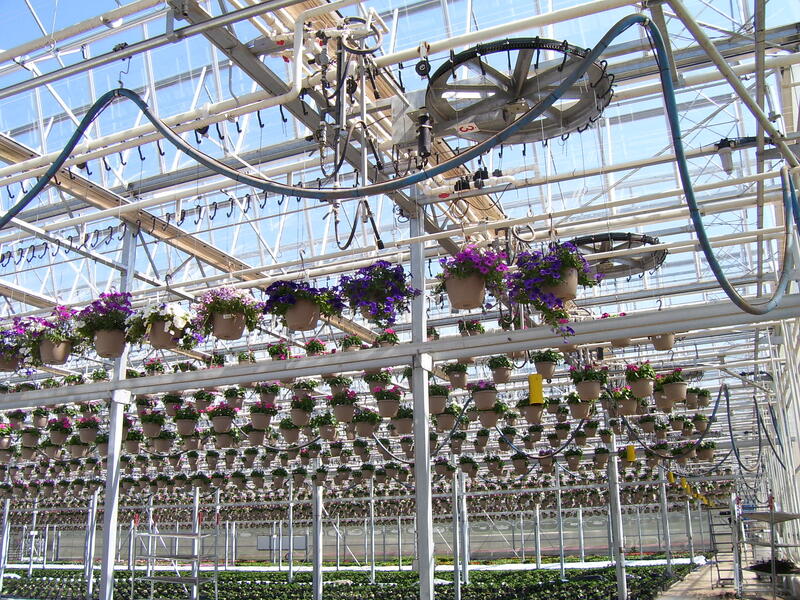 Some growers also add hanging baskets to an overhead support system over the aisle. Automatic irrigation is needed and the watering should be done early in the morning before employees arrive to reduce the drip problem.